For the last 2 or 3 weeks I've found myself listening almost exclusively to Madlib's Mind Fusion series, a pretty rare set of cds featuring a vast display of old soul-jazz-funk-psychedelic-global-whatever records (there are 5 albums/mixtapes in the series, 2 of them feature Madlib-produced hip hop remixes, 3 of them are diverse DJ mixes from Mind Altering Demented Lessons In Beats' famous 5-ton collection of vinyl and those mixes are superb). The song above is from Volume 2 of the series (you can see the full tracklist here) and this tune has captivated me from the first time it hit my ears. It's jazz/soul with an old nightclub feel (the singer, Lorez Alexandria, had performed in Chicago nightclubs in the 1950s but this song is from her 1978 album How Will I Remember You?). I'm entranced by the blend of fast-tapping drums, deep bass strumming slowly, and the singer's strong voice and delivery. Her voice darts and floats like a bird as she sings the seductive story of a ladybird, a Baltimore Oriole, using avian archetypes ("no time for a lady to be dragging her feathers around in the snow"). A bird's eye view of the track reveals the full synthesis of meaning, content, and flavorful delivery---her French-sounding pronunciation of the "r" in Oriole even brings to mind the French word orielle which means "ear" and it's as though the temptress described in the song is also tempting the musical ear of the listener (the oriole is, after all, a songbird). It becomes clear that this was all purposely done by this very talented musician, her bio states that her "clearly enunciated delivery...was always highly sensitive to the import of the lyric she was singing" and the info shown at the bottom of the YouTube clip describes her as "superior at interpreting lyrics." The Baltimore Oriole first received its name because the bird's orange-and-black feathers resembled the coat of arms of Lord Baltimore, a British coloniser in the 1600s who was the first proprietor of the colony of Maryland in North America. The Baltimore Oriole is (surprise!) the state bird of Maryland and, following the pastoral tradition of naming baseball teams after state birds, Baltimore ballclubs have used the symbol of the Oriole for almost 130 years now. The original Baltimore Orioles baseball franchise was founded way back in 1882 (the year James Joyce was born). They were a charter member of the American Association, an old professional league that lasted for ten years. 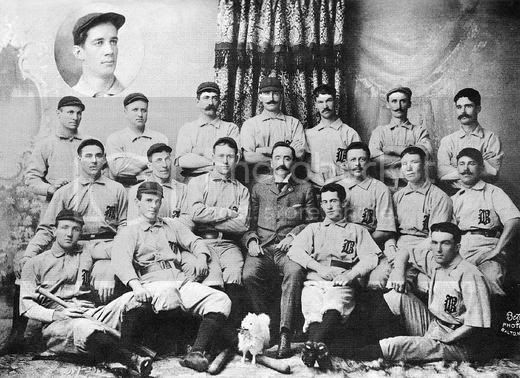 When that league folded in 1892, the Orioles joined the National League (yep, the same National League that the Mets and everyone else play in today) and became a powerhouse, winning three consecutive pennants. During this violent era, the Orioles were known as the absolute dirtiest team of them all. In 1894, the Orioles started a fight on the field in Boston that got so ugly it ended up with the the fans rioting and starting a fire that destroyed the ballpark and 170 surrounding buildings. Led by third baseman John McGraw, who would eventually go on to become one of the greatest managers of all time for the New York Giants, they played rough and they succeeded with it. But just as the 20th century dawned, the National League decide to get rid of four teams including the Orioles. Members of the defunct team went to the brand spankin' new American League and made their own Baltimore Orioles team though they'd only last a couple of years before moving to New York and becoming the Highlanders (eventually changing their name to the Yankees). The Orioles of today that we know and love were originally the St. Louis Browns, another team in the early American League, until the franchise transferred to Baltimore in 1954 and took on the name of the famous old B-more ballclubs. The newly minted Orioles stunk during their early years in the American League but they would eventually build up a pretty spectacular team that managed to stay in contention virtually every year from 1960 to 1983, winning three World Series titles along the way. Having departed San Diego and lost the luxury of rooting for and seeing a nearby baseball team (the Padres) on the regular, I've found thus far this season that I'm clutching to my Mets fanhood as tightly as ever. I'm now deep in the heart of Texas, the state's two pro ball teams are each at least three hours away from me and I've got absolutely no interest in either of them anyway. I don't have cable, so I can't pick up their games on TV and while I do watch baseball on MLB.tv, I'm blacked out from watching any games involving a Texas team. So, early on in the season while league storylines are still developing, I've latched onto my ol' Mets. This year's team got off to a terrible start but they've looked pretty respectable lately as their deep offense has awoken from its offseason hibernation. As I mentioned recently, I've been particularly glad to see Carlos Beltran back in the lineup and mashing the ball like he used to. As I cooked dinner the other night, I watched and cheered loudly as Beltran launched three homeruns against Colorado. This weekend, the Metropolitans make their only trip to the city of Houston (though they do return to Texas to face the Rangers in June) and I've been trying to figure out a way to head over there to see a game but my schedule doesn't allow it and it's a three hour drive each way. I can't help but be annoyed by this, though, because my favorite baseball team is playing within driving distance from here and I'm unable to go see them. I didn't even get to watch last night's game live as it was blacked out. The Mets went about their business anyway and blasted three monstrous homeruns in a nice comeback win against the Astros. For tomorrow afternoon's tilt, featuring the knuckleball-flinging sensation that is R.A. Dickey taking the hill for the Mets, I'll probably resort to tuning into the game's radio broadcast to keep up with the happenings of the National League New York Nine. "I look to the Post front page for overreaction, for gut punches, for the very thing that New York cops, construction workers, store owners and waitresses and anyone else you might run into would say."